Have you noticed Knoxville's new(ly revamped) busses? After taking these pics I finally realized that they really are just the same busses with a new paint job. Who new a little paint go do so much? I was recently talking to a couple friends, and were discussing the old trolley lines that used to run down Gay St. (during the 100 block excavation they were exposed). This got the ball rolling on the "wouldn't it be great if Knoxville had a real trolley again" theme, and I do think that it would be awesome if that could happen. However, once you start to do the math (in your head while drinking margaritas) you eventually come to the conclusion that busses are the answer - there's no expensive infrastructure required. 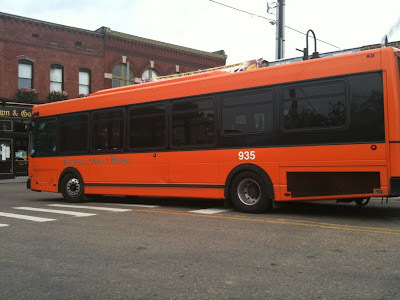 So, if busses are so great, why do so few people ride them in Knoxville? Now, before this discussion goes well beyond my area of expertise - I'm not going to talk about scheduling, routes or anything else. I will say that re-branding the bus line is the smartest (and cheapest) thing Knoxville could have done. Whether or not they actually are more efficient, the new design certainly induces more confidence than say ... the orange and teal mobiles. So, I'm curious, what are your thoughts on the new image? fans and haters ... let's hear ya. The problem with the old system is that it wasn't very big - Westward, it only went as far as the Cherokee country club. i like them! i think i'd feel swanky in one. so mod! so fresh! I have to admit, too, I love the new slogan. Simple, and clever, although it's false advertising, somewhat; in my mind, change is less than a buck. This is a good post, Roberto. Nice and short. That's what matters. Nate, I suspect if you consider the total cost of owning a car, riding the bus would be cheaper, but maybe you did consider that. The grey and black buses are actually brand new. KAT bought 9 of them recently and will be buying more soon. There are actually 3 generations of buses now in KAT's fleet. The new ones supposedly emit far less emissions than the older ones. Cities and the highway system in the US have been designed to create sprawl, which is inherently inconducive to using alternative forms of transportation, such as walking, cycling, or transit. When things are so spread out, you have to drive. 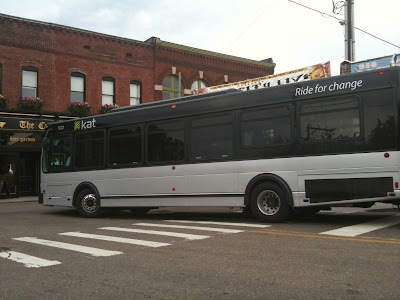 KAT has something similar to bus rapid transit, but not as good as what was described in the article. KAT had three express routes, one to Farragut, one to Cedar Bluff, and one to Halls. Unfortunately, Halls route was just cut for lack of riders. I ride the Cedar Bluff express route (101X) almost everyday. I ride against the direction most would ride (outbound in the AM and inbound in the PM), but the driver said he carries about 15 everyday in the other direction. That bus should be full everyday. It's very comfortable and affordable, not to mention relaxing. Convenience and time. Let's face it, people who work at least eight hours a day don't want to spend the precious time waiting for the bus, plodding along to another stop, then walking further to their office/home. And that's just for the singles, with the hustle and bustle of the modern family its nigh on impossible to use public transit routinely if you want to get more than five or six hours of sleep at night. One of the biggest public transportation advocates(light rail) in my circle of friends cops to driving her car simply because she has to get off work and get her kids to soccer or music practice. She feels guilty, but what alternative is there? I can't use public transpo because of my line of work. It requires me to drive all over the place every day with my own car. I'd totally do it, but wouldn't be able to get my job done without my car. i ride my bike to work, b/c it takes 37 seconds. yessss! B, you will be, I'm sure, interested to know that 37 is the most commonly chosen "random" number. So predictable. What about 22? That's usually one of my default randos. Thanks to the anonymous that posted the KnoxViews link to the trolley map. I'd love to see the whole thing. However, as far as saying the trolley system didn't go very far, I hope you realize that's ALL THERE WAS in 1931! There was little in Bearden; Bearden Hill and beyond was farmland. And, more than likely, the presence of the trolley on Lyons View was due to the need for employees in the rich folks' mansions to get to work. Times change...or do they? A few years ago, one of my New Year's resolutions was to learn to ride the bus. (Hey, easier than losing weight!) So, of course I put it off till December. But, with help from my neighbor Jack Neely, I rode the bus to work and back one day. I liked the IDEA of it, but here's my biggest problem: germs. People were coughing and sneezing and blowing their noses all around me - and then touching every part of the bus I needed to touch. (As I said, it was December.) I guess I'm a baby, but yuk. I still ride the trolleys around downtown sometime. But now, with flu season approaching . . . If you think it's just a paint job, you obviously have not ridden the 'painted' buses. I have. These babies are brand spanking new, with strange automated noises, new doors the drivers don't quite know how to operate yet and that plastic-y new bus smell. Nothing painted about it! I live in 4th and Gill, so I have no need for a trolly line. KAT #22 and #23 both run until 12pm. Since I just got back from Chicago where I spent the entire time riding public transit, I'm more than curious to try KAT again. The only time I used it was my freshman year at UT (way, way back in the day), when UT gave us free KAT passes. That was before I knew how to read a bus schedule, so I kept getting lost. Now that we live in Fourth and Gill, I'm interested in trying the Broadway line to downtown to see how that goes. I'd be willing to use it if it means I never have to park my car downtown again.